Nettles are at their best in the Spring. 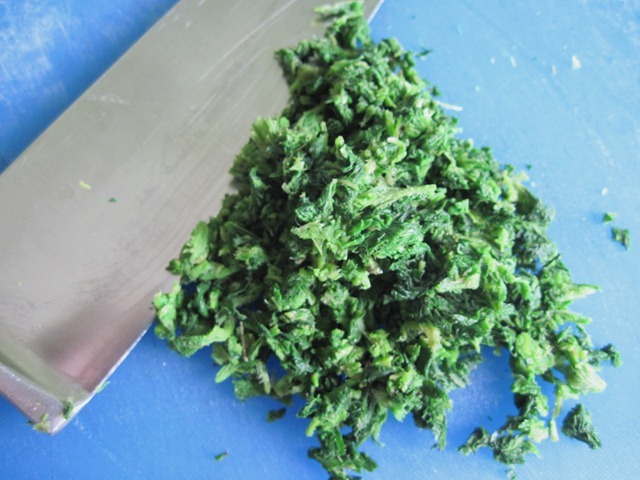 Eat only the young leaves; the young leaf tips and young shoots can be cooked like spinach, pureed or dried for teas. For a refreshing spring tonic I simply drink hot water with a few fresh leaves infused in it. 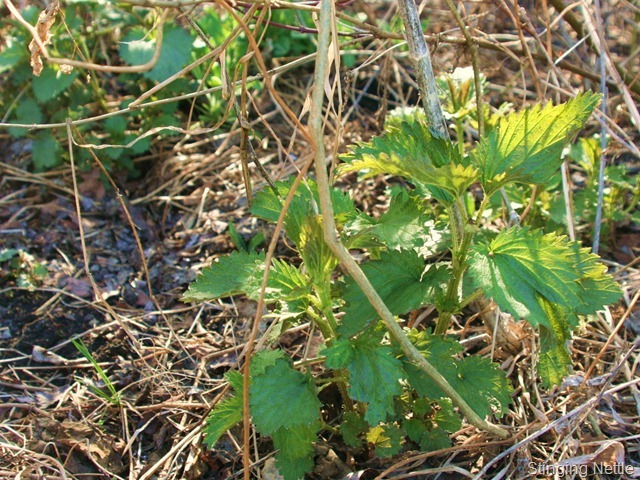 The nettle’s ovate leaves are covered with bristly hairs that can be painful to the touch. To avoid the leaf spines, wear gloves when harvesting and preparing. There are those individuals who can pick nettle sans gloves and are unfazed by the sting. Sadly, I am not one of those individuals. I find that if I inadvertently touch nettle, the “sting” lasts for quite some time. That is the stinging truth about nettles! In last week’s post I threatened to make tortellini. Well, that was an idle threat. 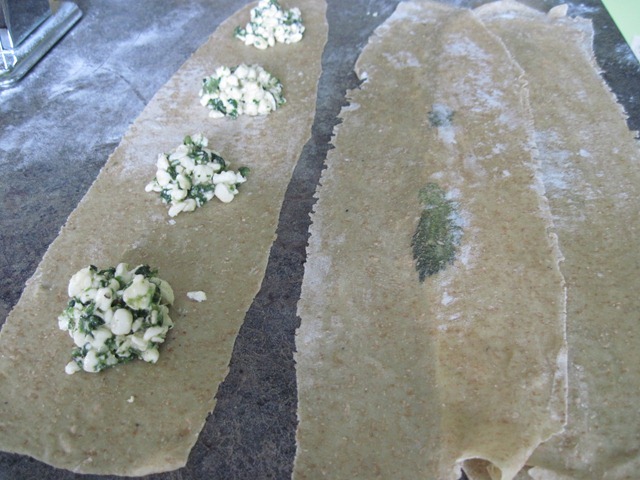 I have decided instead to make ravioli filled with ricotta and stinging nettle. You can make any kind of pasta you like. Follow your favourite recipe. I made a whole wheat dough with 1/2 cup whole wheat and 1/2 cup all purpose flour. You don’t need a fancy schmancy pasta machine – I use an old hand crank machine with excellent results. You don’t have to make perfect squares. Relax. Be creative. Homemade pasta is easy to make and the taste and texture is unbelievable. You don’t need any special equipment or special talent. 1. Prepare the pasta dough and set aside to rest for an hour. I am not going to show you how to made pasta dough here – there are many good books with good instructions. 2. 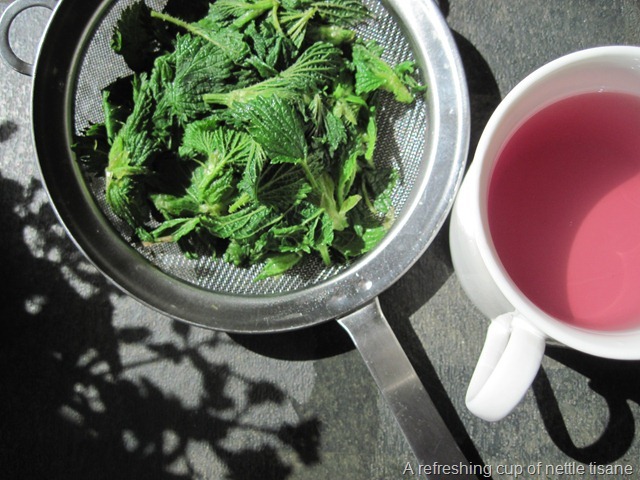 Blanch stinging nettle in boiling water. Drain well and, using your hands, squeeze to remove excess water. Chop finely. 3. 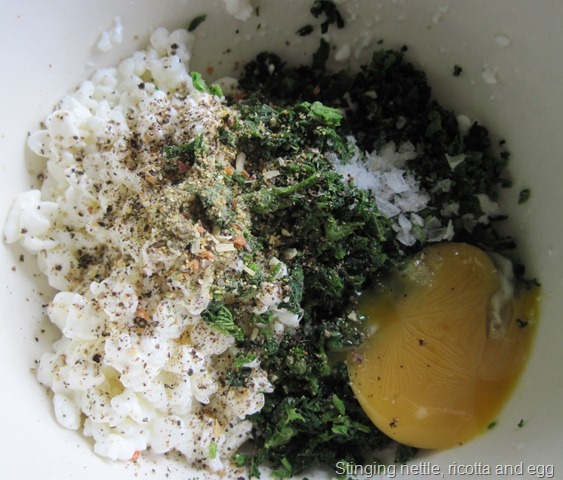 Combine the ricotta and egg yolk; stir in nettle and season with salt and pepper. 4. When dough has rested, cut into four pieces and roll each piece out to the thinnest setting on your pasta machine and cut the pieces into 12 to 18 inch lengths for ease of handling. You can roll the dough without using a pasta machine but whole wheat dough is pretty stiff and it can be difficult to get it thin enough. However, you may prefer thicker ravioli – simply adjust the length of time it takes to cook. 5. Roll out all the dough and lay pieces one on top of the other with a light dusting of flour between each layer. 6. 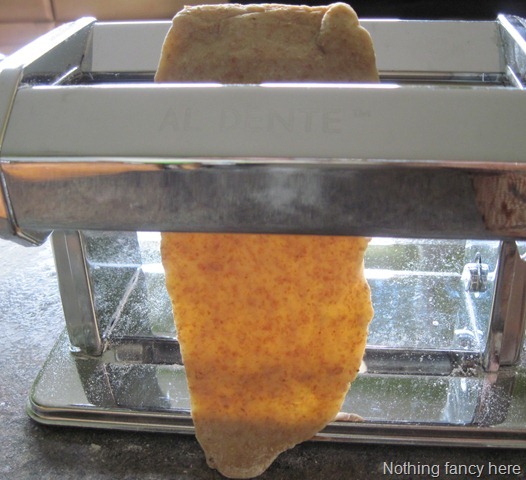 Lay one strip of pasta on a lightly floured surface. My strips of dough ended up about 3 inches wide and 12 inches long. I like big ravioli so a strip of pasta 3 x 12 will yield 4 big ravioli. Place 4 rounded tablespoons of filling down the centre of the pasta leaving about 2 inches between spoonfuls. Your dough will probably be larger or smaller. These don’t have to be perfect. 7. Paint a strip of water around the edges and between the spoonfuls of filling. Lay a length of pasta over the filling. Press between each ravioli to form a seal forcing the air out as you go. If you have a ravioli cutter use it to separate each ravioli. If you don’t, use a knife or pastry scraper which is what I use. Set the finished squares on a floured surface or baking sheet. 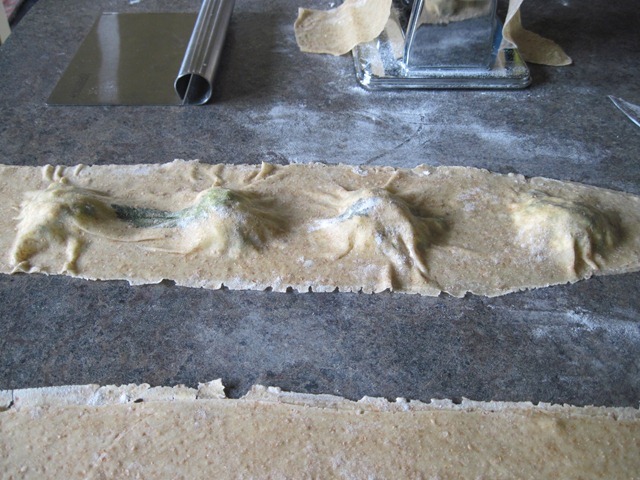 I rolled leaves of dried nettle into the pasta which is what you see here – press the leaves into the pasta and roll. You can simply skip this step. 8. Bring a large pot of salted water to a boil. While you are waiting, in a medium saucepan cook the butter over medium heat, stirring occasionally. 9. Add ravioli to boiling water and cook for 3 or 4 minutes. Test by trying a corner of one – fresh pasta does not take any time at all to cook. Meanwhile, the butter should be browning up – 3 minutes. Remove pan from heat and let sit for 1 minute. Stir in balsamic vinegar, salt and pepper. 10. Plate ravioli spooning brown butter sauce on top. 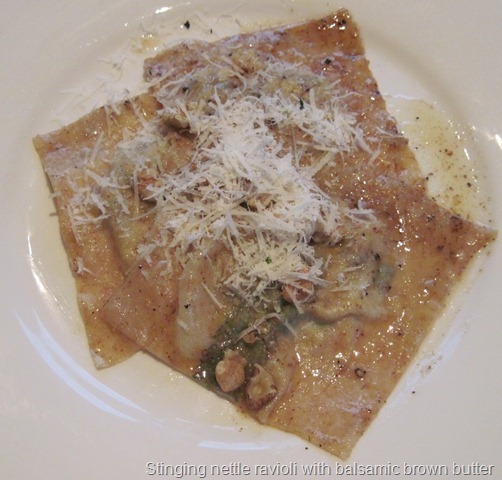 Finish with walnuts and parmesan cheese. Serve at once. Now all this may seem complicated but it isn’t really. You can skip the whole pasta making thing and simply use wonton wrappers. They are simple to use and no one will know that you didn’t make them yourself. I won’t tell anyone. What you accomplish with the recipes I share with you is what makes me eager to share more. As always, thanks for following. Your blog posts are always interesting. 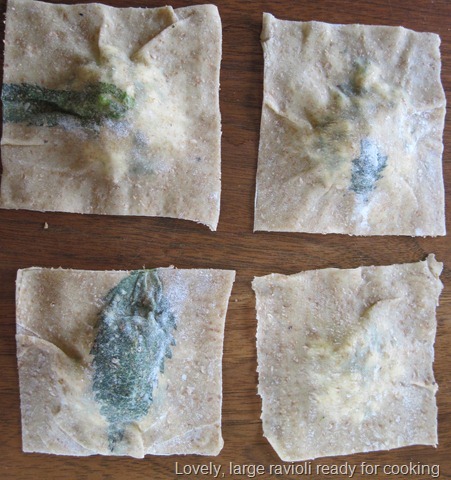 Who knew you could put stinging nettle into ravioli! We visited the Okanagan, and your farm, last September for the first time – are planning to go back this fall again, for longer this time. What a beautiful part of the world it is. Just enough mountain presence there for us prairie folks (we live near Winnipeg now but are originally from Saskatchewan and are still very Roughrider green). Also enjoyed following your earlier posts from Europe, with some envy I must admit. Thank you for following. I hope you will have time during your next foray into the Okanagan to visit our farm once again. I am planning to have a Cassis Infused Wine Vinegar available, however, due to the vagaries of weather this year and farming in general, we will just have to wait and see. Apparently, it is not or imagination that this spring has been unusually cold. But then I don’t need to mention to you prairie folk that startling revelation. Thanks again.